Over the past couple of weeks, I've been trying different ways to gain insight into my little corpus of 2000+ Patient Health Records (PHRs). Topic modeling is one way to do it, and I've been meaning to learn gensim, a Python library for topic modeling, so I decided to use gensim to do some topic modeling on this dataset. I have used Mahout for Topic Modeling before, but my data is quite small and doesn't need the complexity of Map-Reduce (besides the objective is to learn gensim :-)). As a bonus, gensim also offers a wrapper for Mallet, another popular Java topic modeling library. This post describes my experiment. Ultimately, the insights I got were not particulary interesting, but it got me familiar with gensim. I hope you find it useful. The source format of the dataset is a collection of JSON files. My first step is to pre-process the data so that the text portion is written out into a collection of text files. In hindsight, this seems redundant since this could be merged with the next step, but it makes things a bit clearer if separated. tfn = os.path.splitext(fn) + ".txt"
The next step is to convert the texts to a format that gensim can use - namely a Bag of Words (BoW) representation. Gensim expects to be fed a corpus data structure, basically a list of sparse vectors. The sparse vector elements consists of (id, score) pairs, where the id is a numeric ID that is mapped to the term via a dictionary. Gensim's author has taken pains to keep its memory requirements down by using a streaming approach to build corpora and dictionaries. The iter_docs() function below implements this streaming approach. In the code below, I read the text of each file, pass the words through gensim's tokenizer and filter out stopwords (from NLTK's English stopword list) using our custom MyCorpus class. These words are used to create a dictionary and BoW corpus, which is serialized to files for use in the next step. I didn't know (and didn't have an opinion about) how many topics this corpus should yield so I decided to compute this by reducing the features to two dimensions, then clustering the points for different values of K (number of clusters) to find an optimum value. Gensim offers various transforms that allow us to project the vectors in a corpus to a different coordinate space. One such transform is the Latent Semantic Indexing (LSI) transform, which we use to project the original data to 2D. 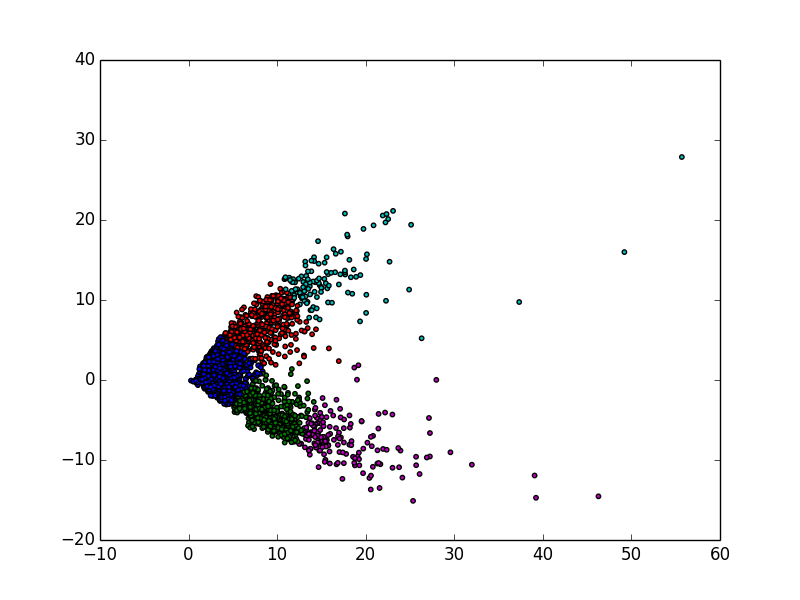 Next I clustered the points in the reduced 2D LSI space using KMeans, varying the number of clusters (K) from 1 to 10. The objective function used is the Inertia of the cluster, defined as the sum of squared differences of each point to its cluster centroid. This value is provided directly from the Scikit-Learn KMeans algorithm. Other popular functions include Distortion (Inertia divided by the number of points) or the Percentage of Variance Explained, as described on this StackOverflow page. I plotted the Inertias for different values of K, then used Vincent Granville's approach of calculating the third differential to find an elbow point. 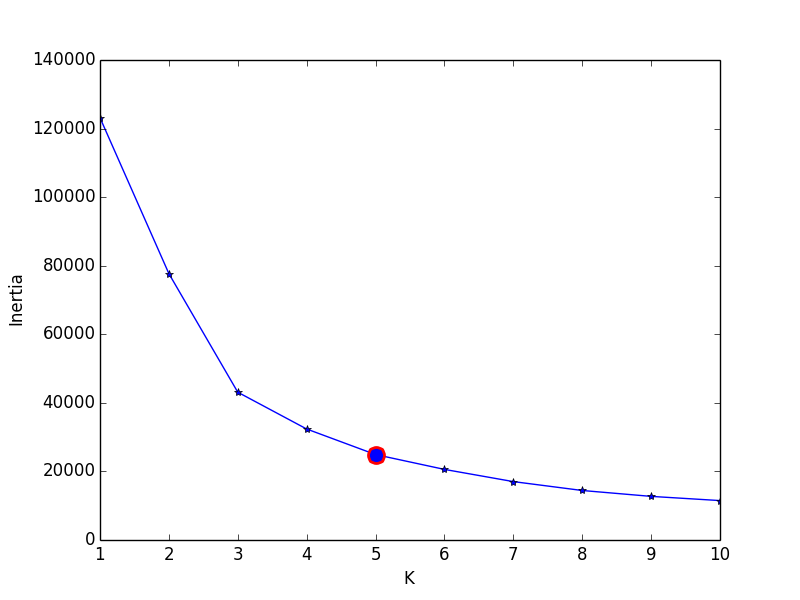 The elbow point happens here for K=5 and is marked with a red dot in the graph below. I then re-ran the KMeans algorithm with K=5 and generated the clusters. which gives me clusters that look like this. I then ran the full LDA transform against the BoW corpus, with the number of topics set to 5. As in LSI, I load up the corpus and dictionary from files, then apply the transform to project the documents into the LDA Topic space. Notice that LDA and LSI are conceptually similar in gensim - both are transforms that map one vector space to another. The results are as follows. As you can see, each topic is made up of a mixture of terms. The top 10 terms from each topic is shown in the output below and covers between 69-80% of the probability space for each topic. and here is the same information shown graphically using wordclouds (generated using the code below). As I mentioned earlier, the only insight I get from the above is that the data seems to be predominantly about patients, history and procedures. But we already knew that :-). Some ideas for improvement for the future. One could be to really get aggressive about removing noise words, much more than just the NLTK English stopwords, that way we could remove terms such as "without" and "year" from the input, possibly resulting in a cleaner set of topics. Another could be to check for higher values of K, perhaps against a higher dimensional space, since we are computing the elbow analytically anyway. Very useful tutorial and discussion! I'm an information systems PhD student trying to do a literature review for a paper, and starting to feel quite lost. I was planning to do this with gensim just to check if I'm missing something obvious, but I'm not much of a coder so it really helps to see the steps laid out clearly. Thanks Brendon, glad it helped! Thanks for this! No question that the ntlk stopword defaults are far too minimal. I see this as one of my favorites post about the subject, I am implementing it with my own corpus however no matter the size of the corpus 1.000, 10.000, 90.000 docs all time i get same number of topics(3), could you please give some idea regarding why that could happen? Thanks Angelo. I am guessing you are referring to the method I described to automatically find the optimal number of clusters? I can't think of a reason why it should always return 3. Did you try applying the method to the some of the other measures and see if it changes? Very informative overview Sujit. I'm fairly new to Python but do understand the statistics behind it. How would you code this when you only have a single .txt file as the corpus? Each line in the text represents a document. I do not have JSON files. Thanks Patrick. The easiest way to do what you want would be to just modify the gensim_preprocess.py code to read a text file and dump out each line of the file into a separate text file, and use that corpus going forward. so there is: text1.txt, text2.txt, text3.txt etc. In total 300 text files. Ran the analysis and now looking for a way to be more aggressive (adding more stop words) with the English stop words nltk library. There is a lot of noise in my data set. These are words that will return in almost every document. Do you happen to know how I can import these additional stop words? Cool, congratulations! One way to find additional candidates for stop words could be to find the ones which occur in large number of documents (hence their predictive power is low). This is typically done by computing each word's IDF (Inverse Document Frequency) = log(number of documents / (number of documents containing word + 1)), and cut off low values of IDF (maybe using a chart to detect a knee). "This is typically done by computing each word's IDF (Inverse Document Frequency)"
Is there a specific Python script for this so I can work through my corpus of .txt documents? Based on IDF want to select those words that occur very frequent. Also how would you add those words to the stop word list? Thank Sujit for your clear explanation and the code .. I wonder how i can print the final topic/document mapping .. i.e. the topic ID for each Doc ID ..
where doc_bow is the vector for each individual document in the corpus. Thanks for the interesting work. Could you please give an explanation of projecting 2D semantic space by LSI to find a number of topics and later applying the number to LDA modeling? What is the reason for using LSI first instead of LDA? Hi 라일, you are welcome. I used LSI to estimate the number of topics to pass into LDA. I guess I could have tried to estimate the number of topics by cross-validation with LDA. But I couldn't think of an objective measure to evaluate LDA to figure out which number of topics is "best". I am sorry if this question has already been asked and if you have answered it, but I just wanted to get your soundbyte on gensim vs pylucene. I need to decide which one to use for a project of mine and I would be grateful to hear your opinion about which you like better. I need only basic IR implementations, i.e. TDF-IDF, consine score, etc. However, my dataset is extremely huge, so I need efficient implementations. Thanks in advance. Hi Pavithra, I often use Lucene (although less using pyLucene and more through Solr's and now ES's HTTP interface) as a persistence mechanism for large datasets, but usually when I can get away with comparing one document to another. Since you are looking for absolute numbers (TF-IDF, cosine similarity) Lucene may not be the best choice - reason being that the default Lucene similarity implementation TFIDFSimilarity approximates cosine similarity but has some differences introduced for performance (but this similarity is still very good for relative scoring, which is what it is used for anyway). OTOH, gensim does implement TF-IDF and cosine accurately and is built to be used in streaming mode, so as long as you can accomodate one document in your dataset in memory at a time, you should be good. Thanks for this post! It was a great help and very insightful (especially on using LSI to determine the number of topics for LDA). One question -- what is in the file final_topics.txt in the wordcloud step? I didn't see a previous step to create/export out this file before it's called in the wordcloud part. Hi Ryan, you are welcome, glad you found it helpful. The credit for the insight around using LSI really belongs to Dr Vincent Granville, who suggested it in one of his posts on LinkedIn. The final_topics.txt file is just the data that is written out to STDOUT by lda.print_topics, I captured it into a file and parsed it. Using LdaModel.show_topics() was probably a better way to get a structured set of words and probabilities instead of parsing the output of LdaModel.print_topics(), but at the time I didn't know about it. Thank you very much for this great informative post on GenSim, I am glad I got your post as google search result for GenSim. I am a software engineer in web and server-side general programming, but have little knowledge on Machine Learning . If you can provide your thoughts on my problem described below , that will be great help . I am planning to develop a Webservice which will do classification of Elementary Mathematics Word Problems for grades 1 to 5 . The following url Link gives in Idea on what type of classification I am trying to achieve . It would be great help if you can through some light WHICH of the above FOUR may suite well for the kind of problem I am trying to solve . Here is some reference from a Research Paper on similar kind of Mathematics Topic Modelling problem they are trying to solve . Hi Reddy, all of these packages are good, although I am only familiar with Gensim and MALLET. You will have to try them out against your test data - in general they might have slightly different default values, but otherwise tuned results should be similar. However, from the PDF it looks like you are trying to solve a classification problem. Topic Models will return you a set of (unnamed) topics and a set of (word, probability) pairs for each, where the probability is the probability of the word appearing in documents for that topic, whereas what you probably want is just a single number indicating what type of problem it is. If so, you can still do the topic modeling to reduce the input data to a small set of weighted features (where the features are top n terms from each topic and the probabilities are the weights) and then run it through a classifier. Alternatively, you can start with terms directly without the topic modeling step. Thank you very much Sujit for taking time to understand my lengthy question and providing your views . your answer clears the fog in my head about the difference between Classification and Topic Modeling . Thanks Ole. Are you getting an error message when trying to generate coords.csv? Can you post your error stack trace if so? Maybe the gensim API changed from when I used it for this stuff. Thanks Soham, and you are welcome! The topics you are getting seem very typical when using few topics. They tend to be uninformative and have a great deal of overlap. I would suggest experimenting with the number of topics. Thanks Ólavur, good suggestion, maybe the the reason words are bleeding into each other is because there are too few topics. I don't think I have the data anymore, but will keep this in mind for future experiments. You can try Hierachical Dirichlet instead of LDA. It will automatically generate the number of topics. Gensim has a method. Usually it suggest more topics than a typical person would intuit. Thank you, I didn't know about this, will check it out. Great and detailed tutorial. It has been insightful and very helpful. One comment regarding the elbow point of the inertia curve. I was having the same problem as angelo337, argmin sometimes returned 0, and the +3 in the "elbow = np.argmin(diff3[3:]) + 3" was the reason the number of k for the elbow point appeared to be 3 for many runs. I tried this with 1-50 K in 2D (LSI for 2 topics), and the number of topics was 8 which seemed as an elbow point. Hi Abd, thank you for the kind words, glad it was helpful. Thank you for the kind words Mitchall. I looked at the original link for Dr Granville's method (it was wrongly set in the post, corrected it now), and talks about using argmax of the third derivative of the percentage of variance explained (PoVE). 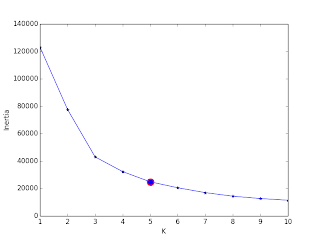 Scikit-learn gives me inertia, ie, the sum of distances of samples to their closest centroid, and as I increase k it seems to fall. Intuitively, the tighter the clustering (lower inertia), the more the PoVE, which you can also see in the chart in Dr Granville's post, so almost like PoVE = 1 - inertia, that is why I chose argmin (since the negative sign would carry over into the third derivative). But maybe better approach might be to do argmax on 1-inertia instead. Also from the link, if the third derivative is 0, then probably we should fall back to the argmax of the second derivative. Yes you are right, argmax on the 3rd differences on PoVE is equivalent to argmin on the 3rd differences for the inertias. It was the 0 third derivative case causing the problems. Thank you very much for sharing the code! I am getting an error while running the 'wordcloud' section. The error is as follows. topic #0 (0.020): 0.007*"market" + 0.006*"pension" + 0.005*"stock" + 0.005*"credit" + 0.004*"stake" + 0.004*"said" + 0.004*"inc" + 0.004*"million" + 0.004*"companies" + 0.004*"new"
topic #1 (0.020): 0.014*"fed" + 0.011*"federal" + 0.010*"mr" + 0.010*"said" + 0.009*"chairman" + 0.007*"bernanke" + 0.006*"policy" + 0.006*"financial" + 0.006*"would" + 0.005*"year"
topic #2 (0.020): 0.017*"u" + 0.016*"bank" + 0.014*"currency" + 0.011*"german" + 0.010*"japan" + 0.008*"west" + 0.008*"banks" + 0.007*"japanese" + 0.007*"germany" + 0.006*"said"
topic #3 (0.020): 0.013*"stores" + 0.009*"said" + 0.007*"store" + 0.007*"year" + 0.007*"wal" + 0.007*"sales" + 0.006*"mart" + 0.006*"retailers" + 0.005*"shopping" + 0.005*"inc"
topic #4 (0.020): 0.136*"airplane" + 0.039*"leaves" + 0.014*"finding" + 0.014*"new" + 0.008*"recession" + 0.007*"says" + 0.007*"york" + 0.007*"statistics" + 0.006*"know" + 0.006*"year"
topic #5 (0.020): 0.046*"euro" + 0.045*"dollar" + 0.019*"yen" + 0.016*"u" + 0.014*"currency" + 0.010*"ecb" + 0.010*"europe" + 0.008*"european" + 0.008*"currencies" + 0.007*"new"
topic #6 (0.020): 0.031*"investors" + 0.031*"stocks" + 0.028*"talking" + 0.021*"brian" + 0.020*"engines" + 0.020*"gate" + 0.020*"montagu" + 0.017*"rolling" + 0.017*"catch" + 0.016*"worried"
topic #7 (0.020): 0.011*"would" + 0.010*"tax" + 0.006*"new" + 0.005*"year" + 0.004*"prices" + 0.004*"capital" + 0.004*"cut" + 0.004*"market" + 0.004*"bill" + 0.004*"said"
topic #8 (0.020): 0.062*"contradictory" + 0.062*"balanced" + 0.043*"leaves" + 0.016*"budget" + 0.015*"rolling" + 0.015*"neither" + 0.012*"tax" + 0.008*"inflation" + 0.008*"spending" + 0.007*"economic"
topic #9 (0.020): 0.215*"midland" + 0.007*"stage" + 0.007*"fowl" + 0.007*"shuts" + 0.007*"taxis" + 0.007*"connotes" + 0.005*"said" + 0.005*"economy" + 0.005*"india" + 0.005*"balanced"
Hi Mohammed, looks like the wordcloud package (https://github.com/amueller/word_cloud) has changed. Take a look at examples/simple.py to see the new usage pattern. I am a python beginner. I tried to modify the code but did not work. Could you please update the wordcloud part of your code. This is a wonderful process. I was contemplating how to best analyze the output and I like both your K-means and textual approach. I used to work in bioinformatics and found the end-user needed both. Could you make a recommendation as to how I could try your approach on Pubmed, or Google Scholar? @Mohammed: I will update once I find some time. Unfortunately too many things going on at the same time right now. @Tim: thanks for the kind words. Actually I cannot take credit for the K-Means approach, I learned about this from Dr Vincent Granville's blogs. I have found it to be mostly useful in my experiments. Regarding running on Pubmed or Google Scholar, you probably need something that will scale to that kind of data volume - my current big data tool is Spark thanks to my employer. Spark supports LDA using GraphX. The value of k would vary based on whether you were trying to cluster/featurize for some downstream process or simply try to understand the data. In the latter case, the advice I have read is generally to keep k <= 20.